Cute Jewellery by Chelsea Doll: Quick Twitter Competition! We're having a quick competition over on our Twitter page. 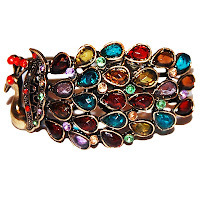 If you fancy a chance of winning this gorgeous Jewelled Peacock Bracelet, simply follow and retweet us! As simple as that. So go on, what are you waiting for? Competition closes at 10pm, Friday 14 January.